Here are you candidates for the 2019-2020 Elections! Vote March 28 & 29th! My name is Shaianne Young, and I am a fourth year student completing my degree in Psychology with a minor in Business Management. Upon joining this program, I instantly became an active member in the Psychology Students’ Association (PSA). Within the previous two years, I served on the PSA as both the Director of Promotions and Marketing and the VP Philanthropy and Activism. I organized uOttawa’s first SleepOUT event, coordinated a PSA cheering station for the Canadian Army Run in hopes of raising money that would go towards The Natasha's Wood Foundation (for mental health), amongst many other initiatives. In the upcoming PSA election, I will be running for the position of President. If elected I would like to maintain and improve the professional reputation of the PSA, assist and advocate for psychology students during this transition period of our new student union and new provincial policies, increase interest in the PSA’s events and initiatives alongside other PSA Executive members, and most importantly, ensure there is a sense of inclusion and community amongst psychology students. I would love to represent you as your President this upcoming year, so please come vote! Hi! 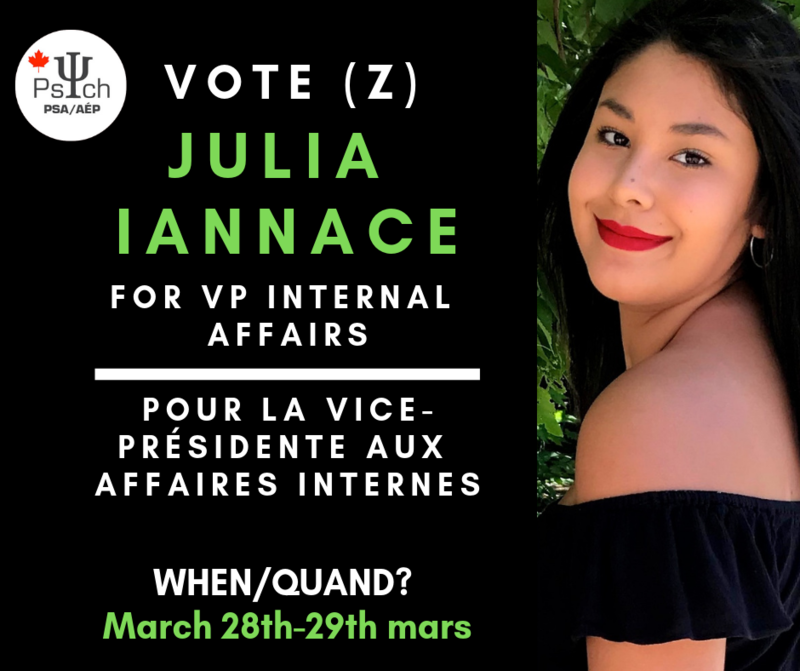 My name is Julia Iannace and I hope to be the next VP of Internal Affairs for the PSAÉP! Implementing office hours so that students are able to access all of the services the PSAÉP has to offer. I will take-over or aid the president in her responsibilities when additional help is needed. 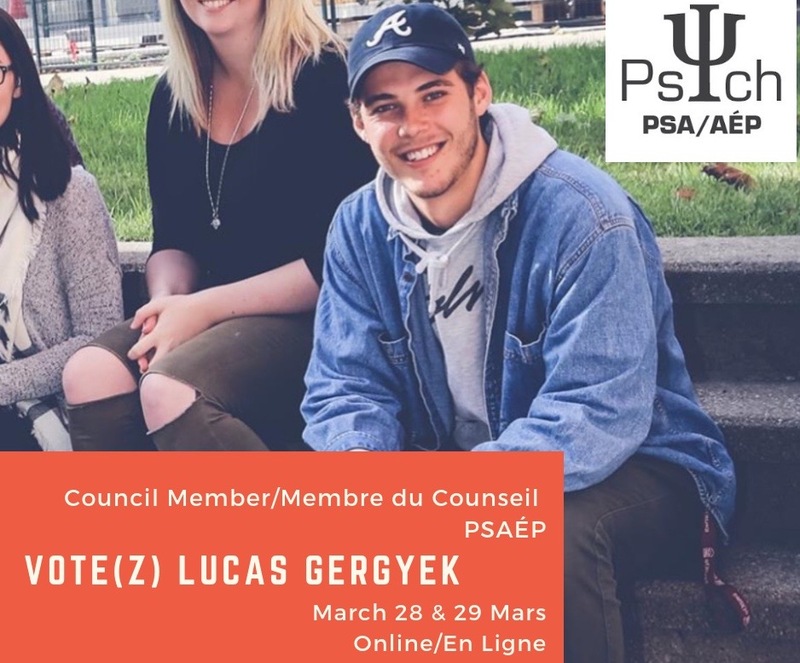 I plan to hold one general assembly each semester in order to allow students to voice their concerns and opinions regard the PSAÉP’s constitution. I hope to actively work with the fellow vice presidents on their projects in order to allow events to run more smoothly. I promise to ensure full transparency of the PSAÉP through recording meeting minutes and making them accessible to students through collaboration with the VP of Communications. As an executive member, I wish to aid students in the exploration of the social and academic opportunities available to them through being a part of the PSAÉP! My name is Abraar Elmi and I am a third-year student completing my honours degree in Psychology (BA). I am running to be your new Vice President of Social Affairs. This will be my first time running for the PSA but I have been happily involved in 101 week for a few years now. I have always wanted to be more involved with the PSA ever since my first 101 week as a first-year student. My goals are your VP Social are the following: -Plan the greatest 101 week of all 101 weeks. -Foster an environment where everyone feels welcome and that their opinion and what they have to offer is valued. -Make sure that the events are just as much for our francophone students as well as for our anglophone students. -Make all events accessible. -Prioritize safety and consent. -Create a diverse range of events to reach out to all our students. -And of course...have fun!! Vote online March 28-29 for me as VP Social and I promise a year of fun and new ideas! 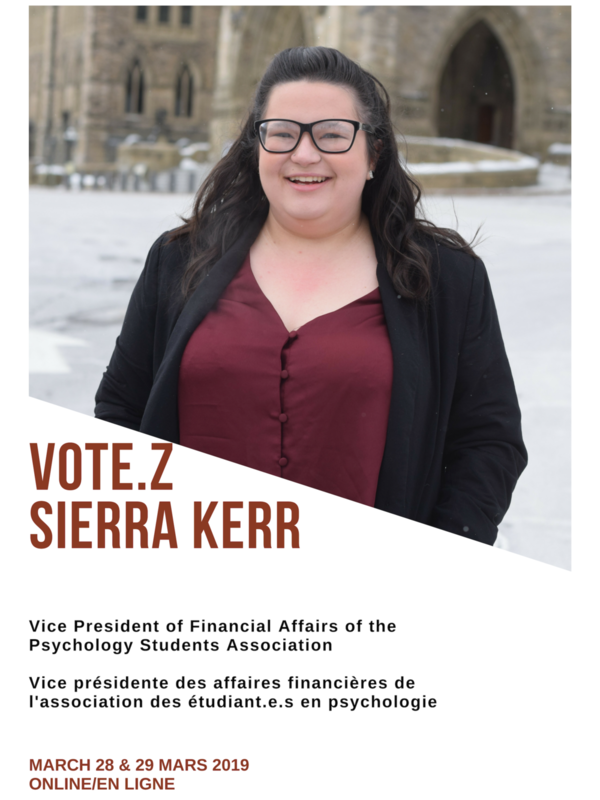 My name is Sierra Kerr and I want to be your next Vice President of Financial Affairs of the PSA for 2019-2020. I have understanding in budgeting, I have worked for multiple not-for-profit organizations, and have knowledge of the university and government funding and taxing, which I believe will allow me to help the association. Vote online March 28th and 29th! Hello! My name is Paola Garcia, and I am a graduate of the Bachelor of Health Sciences and Life Sciences program at the University of Ottawa. Currently, I’m pursuing my studies as a first-year student of Psychology (B.Sc.). 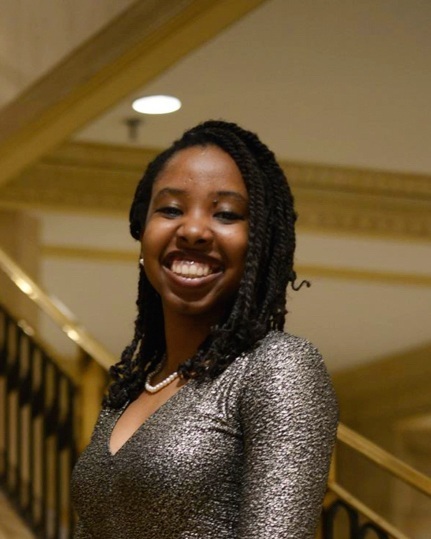 I am running to be the Vice President of Communications for the Psychology Students’ Association (PSA) for the 2019-2020 school year. As a former Health Science student, I worked closely with the executive team of the HSSA and volunteered with the Health Promotion team, which gave me the necessary expertise to promote various materials to students. As a result, I felt fortunate to serve on the PSA as the Director of Promotions and Marketing this previous year. If elected I would like to better engage and create a sense of community within psychology students, to improve current and future students’ program experience. I will always do my best to surpass your expectations, not only by promoting PSA initiatives, but by also ensuring that all students have the adequate access to information in both official languages. As always, thank you for your time and your consideration, and please come vote! My name’s Lucas Gergyek, I’m originally from this small town west of Toronto called Waterdown, and I’m currently in my 3rd year of the BA Psychology program at uOttawa. I’m passionate about optimizing student experience at the university - I hope to have the opportunity to represent you as Council Member for the 2019-2020 school year! With the instatement of a new student government for the upcoming school year I am excited and prepared to tackle a changing political atmosphere at the university. 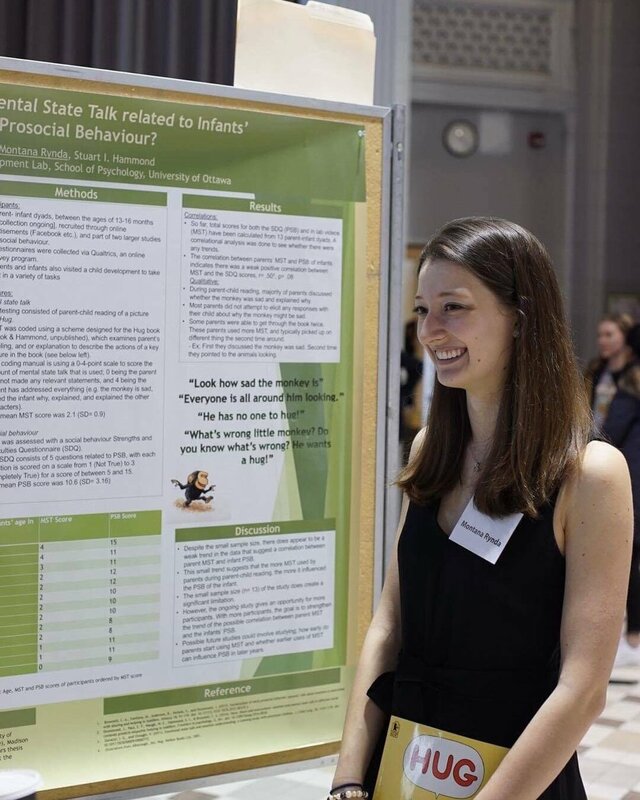 If elected I vow to represent the psychology undergraduate students in a professional manner; I look forward to making the opinions and ideas of all psychology students heard at PSAÉP meetings. Additionally, I will advocate for the most advantageous academic, networking and social opportunities for students. Ultimately, my goal is to act as a detailed and transparent liaison of information from Executives and the university to every undergraduate student - this will allow for you all to make informed decisions regarding your academic career moving forward. Thanks for reading, please vote online March 28th & 29th! My name is Montana Rynda, and I am a fourth year student in the B.A psychology stream. I would be honored to represent the voice of the undergraduate students in meetings with the department of psychology as one of the next council members. I believe I would make a great representative because I have had four years of experience listening to the concerns from student of all years in psychology. I know the stress and pressure of not knowing what you have to do for your thesis, credit requirements and graduate school, and I hope to best represent you in meetings about these concerns. I also hope to continue the amazing progress done by past council members, as well as making improvements of the new issues arising. In my fourth year at UOttawa, I feel as if it is my turn to try and make a difference and help improve the program for current and future students. I want to help, so please reach out with any concerns you may have ( mrynd050@uottawa.ca ) and please vote ‘YES’ on October 4th and 5th. Thank you!